Supporters of deposed Honduran president Manuel Zelaya are seen outside Toncontin Airport where they rallied to bid goodbye to Zelaya and his family in Tegucigalpa on Wednesday. (CNN) -- Ousted Honduran President Manuel Zelaya has left his temporary home at the Brazilian Embassy in the capital, Tegucigalpa, and is en route to the Dominican Republic, local media reported Wednesday. A deal reached last week with Honduran President-elect Porfirio "Pepe" Lobo granted Zelaya safe passage to the island nation, resolving a diplomatic impasse that kept him trapped in Honduras, according to Dominican President Leonel Fernandez. Zelaya was ousted in a June 28 coup and sent out of the country. Charges of treason and abuse of power were subsequently filed against him. 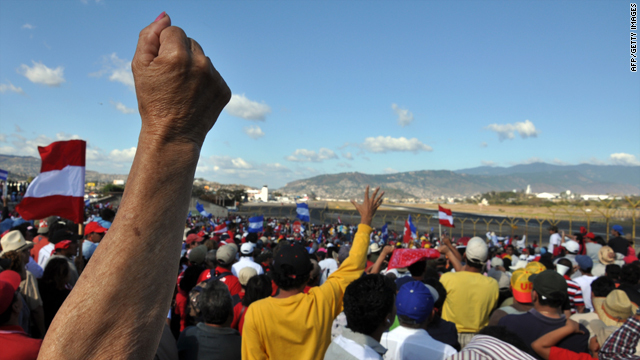 At a news conference last week, Lobo called the deal the first step toward re-engaging Honduras with the international community, which repudiated the coup. After spending months in exile, Zelaya sneaked back into Honduras in September, holing up at the Brazilian Embassy. His return was an effort to restart talks to negotiate reinstating him as president. Last week's agreement allowed Zelaya to leave the country as a guest, rather than under political asylum. "This is an exit with dignity," Fernandez said last week, adding that Zelaya has indicated that his final destination likely will be Mexico. Lobo took the office of president Wednesday.